Stephanie over at Space Cadet Yarns was kind enough to feature our new Granite Lake Shawl in her newsletter this week. I’ve been following her blog and ogling her yarn for a good while now. If you’re looking for fun and knitting then this is the place. Just check out these colors! And these are only a few of them. I knew I had some in my stash waiting to figure out what it wanted to be (I have a lot of yarn waiting to talk to me). I do, it’s the DK weight Merino. What’s up for the rest of the summer? Now that the Granite Lake Shawl is published (it was in the top 5 for Ravelry for 4 days so thanks!). I’m preparing to change direction. While I do have a number of other Showy Garter designs almost ready to go they are fall or winter projects. Soooo we’re going in a new direction with a summer top that introduces … wait for it … yes, yet another way to use the Showy Decrease. You’re shocked I know. Sneak peek knotted Flat i-Cord straps! Here’s the schedule for the next few blog posts, although I reserve the right to go off on a tangent at any time. Reintroduction to the Flat i-Cord with fabulously fun straps that will be used on the summer shell. Announcement of the new Showy technique with a simple cowl as a tutorial. 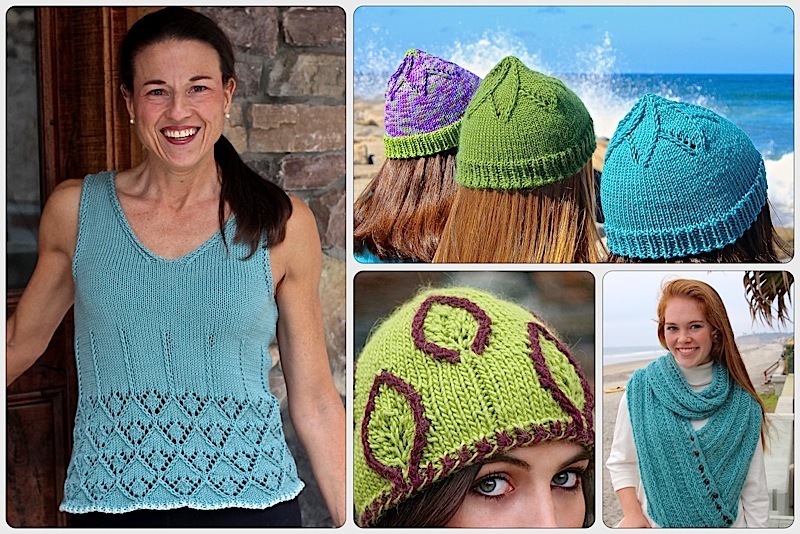 Yes, it’s a cowl but small projects to make great summer knitting. New pattern for a summer top. Some easy, new non-rolling edges to try. It’s going to be a great summer. Hope you all enjoyed your 4th of July. Just for kicks, I thought I would share this photo of my husband yesterday. We had so much snow this winter that Squaw Valley is still open for skiing. With all the crazy holiday traffic he decided the motorcycle was the way to go so he attached his skis to his backpack! I’m surprised I could stop laughing enough to take the photo. Also shown in the photo are my son who will be modeling one of the Showy Garter projects for the fall, our dog Domino and my garden which is happily not covered in snow. You were on TV last night here in the Great Lakes Area ( Michigan) in a segment on what else to do on the 4th – people skiing in shorts and tees! Strange weather! Can’t wait for the summer top. This entry was posted on July 5, 2017 by Laura Cunitz in General, Yarn & Yarn Shops and tagged knitting, Space Cadet Yarn.